Locations of 12 tree swallow (Tachycineta bicolor) breeding sites where geolocators were deployed and recovered (circles; n = 133 individuals), and non-breeding locations (triangles) are superimposed over the breeding (yellow) and non-breeding (pink) range (BirdLife International and NatureServe 2015). The breeding site coordinates and samples sizes within each latitude category (gradients of blue) are in the electronic supplementary material. Funding: Funding for the study was provided by Leaders Opportunity Fund Grants from the Canadian Foundation for Innovation (D.R.N., R.D.D. ), Natural Sciences and Engineering Research Council of Canada (NSERC) Discovery Grants (D.R.N., R.G.C., R.D.D., M.B., D.G., F.P., M.L.L. ), an NSERC Research Tools and Instruments Grant (D.R.N., M.B., R.D.D., D.G., M.L.L., F.P., D.S. ), an NSERC Postdoctoral Research Fellowship (E.A.G. ), an NSERC Industrial Research and Development Fellowship (D.W.B. ), an NSERC Alexander Graham Bell Canada Graduate Scholarship (L.L.B. ), the NSERC Canada Research Chairs Program (M.B., F.P. ), the University of Guelph (D.R.N. ), Environment and Climate Change Canada (R.G.C., O.L. ), Bird Studies Canada (D.W.B., D.J.T.H. ), the University of Northern British Columbia (R.D.D. ), the British Columbia Knowledge Development Fund (R.D.D. ), the Skaggs Foundation (T.B. ), a National Science Foundation Grant DEB-0933602 (C.M.T. ), a National Science Foundation Grant IOS-0745156 (C.M.V., D.V. ), Fonds de Recherche du Que´bec—Nature et Technologies (M.B., D.G., F.P. ), the James S. McDonnell Foundation (C.M.T. ), the Alberta Conservation Association (G.L.H, H.E.T. ), TD Friends of the Environment (G.L.H., H.E.T. ), the Shell Environmental Fund (G.L.H., H.E.T.) and Nature Canada’s Charles Labatiuk Nature Endowment Fund (G.L.H., H.E.T.). The development and analysis of some of the geolocators were supported by the National Science Foundation grant nos. IDBR 1152356 and DEB 0946685 (E.S.B. ), and IDBR 1152131 (D.W.W.). Abstract: Latitudinal differences in timing of breeding are well documented but how such differences carry over to influence timing of events in the annual cycle of migratory birds is not well understood.We examined geographical variation in timing of events throughout the year using light-level geolocator tracking data from 133 migratory tree swallows (Tachycineta bicolor) originating from 12 North American breeding populations. 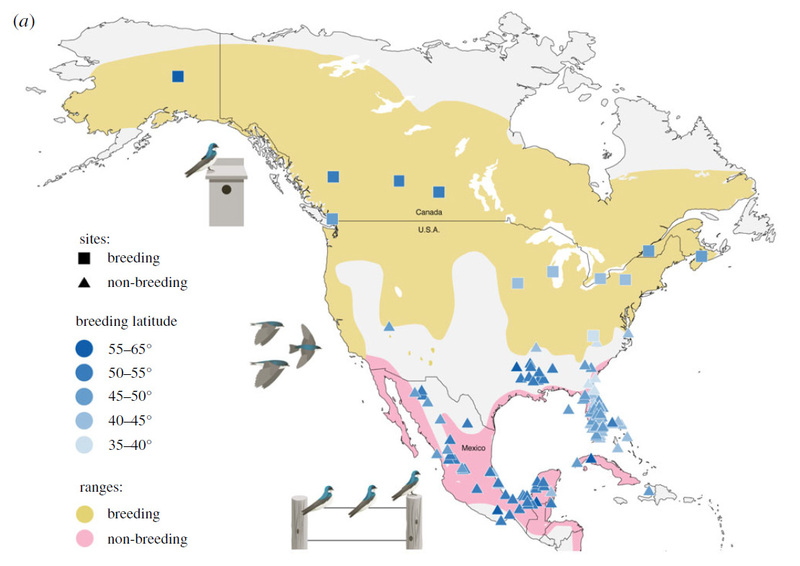 A swallow’s breeding latitude influenced timing of breeding, which then carried over to affect breeding ground departure. This resulted in subsequent effects on the arrival and departure schedules at autumn stopover locations and timing of arrival at non-breeding locations. This ‘domino effect’ between timing events was no longer apparent by the time individuals departed for spring migration. Our range-wide analysis demonstrates the lasting impact breeding latitude can have on migration schedules but also highlights how such timing relationships can reset when individuals reside at non-breeding sites for extended periods of time.